I know snakes have a place in nature and I’m all for that. As long as that place is far away from me. We’ve lived in this house for seven years and this neighborhood for eleven years and I’ve only seen three snakes in our yard. I saw two of those within the past few days. 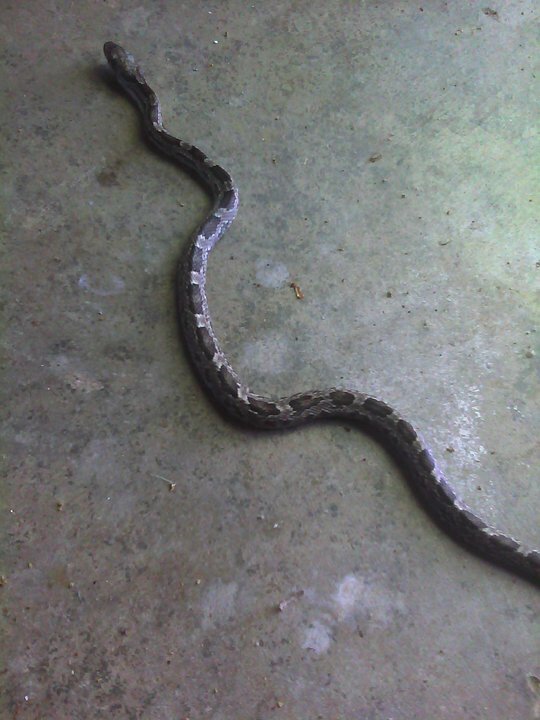 On Friday, I walked out to get the mail and saw a brown snake stretched out across the carport beside my car. It wasn’t stretched far; it was only about a foot long. I was able to sneak up on it to take a picture with my phone. I wasn’t scared of it attacking, but I didn’t want it to get away before I got a picture. This one seems to be a rat snake. Today, on the way to the park, I stopped the car at the end of the driveway, walked to the mailbox, grabbed the mail, started back to the car and froze. Between me and the car, right where I normally walk when I get the mail, was a black snake with yellow rings. At first, it was acting like it was going to come check me out. Since I was in sandals and shorts, I wasn’t thrilled with that idea. I tried to make a wide path to the car to get my phone so I could take a picture, but by the time I got to the phone, the snake had disappeared into the leaves. From what I could find online, it was a kingsnake. I grew up in the country, and I’ve seen a lot of garter snakes and kingsnakes, but I’ve never seen one like that. Now I’ve surely met my quota for snakes this year. If I could just get the word out to all the other snakes in the area, that would be great.